ONTHIS DAY: July 22, 1925. 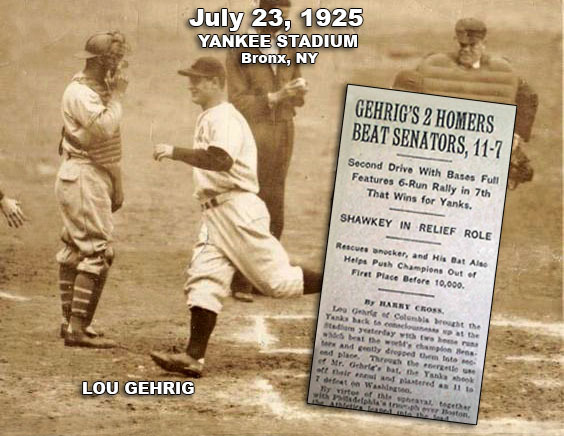 Slugging Yankees first baseman Lou Gehrig smashed two home runs including a grand slam while leading the seventh place Yankees to a 11-7 victory over the first place Washington Senators. Gehrig’s seventh inning blast off the Nats’ Firpo Marberry was the first of his Major League-record 23 grand slams. The big strapping local kid from Commerce High School in New York City became the Yankees’ starting first baseman on June 2, taking the place of Wally Pipp. The day before, Gehrig had pinch-hit for Pee Wee Wanninger to begin what became an incredible streak of 2,137 consecutive games played.